We often turn to specific diets when we need to lose weight, but there’s another way to improve our relationship with food, and that’s through mindfulness and intention. Baron Baptiste, author of JOURNEY INTO POWER, shares 9 tools and questions that can help you change your eating habits for the better. Two of the most fundamental truths of yoga are mindfulness and intention. Both are hardly ever as important as when you are eating. Would you shovel in unhealthy food or monstrous portions if you were truly conscious of what you were doing? 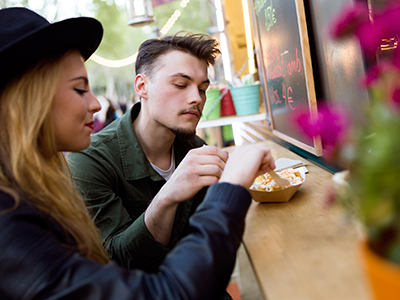 There are many ways to establish more awareness at every meal or snack. The following is a list of tools and awareness questions to bring more mindfulness to every bite you take. If you are ever truly going to find peace in your relationship to eating and food, mindfulness is a must! Before you eat anything, always ask: Am I eating to escape, or to excel? Am I feeding my ego (to deny feelings and numb out), or am I nurturing my body? Is my eating a result of hunger, or to mask a deeper emptiness? Observe a few moments of silence and give thanks for your food. Thankfulness is a profoundly spiritual act that will change your relationship to food significantly. Realize that food has the power to nourish your spirit as well as your body, and call forth gratitude for that gift. It is impossible to experience gratitude and be unconscious at the same time. Listen to your body’s signals. Can you detect when your body says, “enough”? Discovering and following your body’s cues is the master key toward learning to eat mindfully. Become aware of unhealthy cravings. Make a commitment to pausing between having a craving and automatically indulging it. Ask yourself, Where is this coming from? What do I really need? Often, if you interrupt the pattern with some movement, meditation, yoga, and/or a walk, you can redirect your focus and shift out of the craving or need. Try preparing food consciously. Can you be totally present and mindful while peeling, chopping, mixing, and cooking? Can you really notice the colors, textures, and tastes? Being conscious around food, even the preparation of it, is a powerful force in transforming your attitude to it. Become aware of the atmosphere in which you eat. Do you eat on the run, while working or watching television? Or do you take the time to sit down and relax while you are eating? What effect do both scenarios have on your digestion? Eating while you are tense, upset, or agitated tends to trigger negative symptoms in your digestive tract. Eating in a calm, quiet atmosphere, however, sets a relaxed tone for healthy digestion. Bring awareness to what you add to your food (dressing on your salad, sugar in your coffee, butter on your bread). These elements often go unnoticed, but they add up. A student named Elena once told me that when she was younger she noticed that her father added huge spoonfuls of white sugar to his tea every day. So she challenged him to put a spoonful of sugar into an empty soup bowl each time he put a spoonful in his tea. At the end of the week, he was shocked to see that it was almost overflowing! Try Elena’s method and see how much sugar and fat you add to your diet without even noticing. Do you have indigestion, gas, and gastrointestinal strain after you eat? Can you relate these symptoms to the foods you are eating or the combinations in which you are eating them? Attributing stomach problems to what, when, and how much you eat enables you to start regulating more consciously. Pay attention to how your body feels in the minutes and hours after you eat. Are there foods that make you feel tired? Foods that make you feel light? Start relating your bodily sensations to what you’ve eaten to establish the cause-and-effect links in your mind. Again, listen for internal cues. Bringing consciousness to what and how you eat is the magical solution to changing your eating habits. Every bite you take with mindful awareness sets off another spark that lights the way out of the food fog. For more advice on losing weight, increasing your strength and stamina, and sharpening your mental edge with yoga, check out Baron Baptiste’s book JOURNEY INTO POWER. Plus: Do you know the 3 cardinal rules of nutrition? Excerpted from Journey into Power by Baron Baptiste. 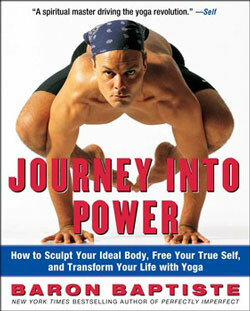 Copyright © 2002 by Baptiste Power Yoga Institute, Inc. Used by permission of the publisher. All rights reserved. Whether you are looking to lose weight, trying to increase your strength and stamina, hoping to sharpen your mental edge, or seeking to go deeper within, Baron Baptiste can take you there. Baptiste Power Yoga isn't just the ultimate workout, it's the ultimate life transformation program. In this unique and inspiring book, one of the world's most dynamic and sought-after master yoga teachers brings us the same revolutionary program for body, mind, and spirit that has changed the bodies and lives of Hollywood celebrities, all-star athletes, and millions of people just like you. In his refreshing and iconoclastic style, Baron Baptiste shows us that the key to true power is not to chase an ideal version of ourselves but to reveal the perfect self already within.